The Flea Theater is delighted to announce Dance Conversations 2011, a festival continuing the spirited debate about dance and dancers for the 2010-2011 season. Inaugurated in September 2003, Dance Conversations @ The Flea is a FREE performance & discussion festival. Curated by Nina Winthrop & Taimi Strehlow, the festival presents works-in-progress by dance artists experimenting with new ideas and new forms. Each event in the series features the works of emerging and mid-career choreographers, with an open discussion between the artists and the audience moderated by Winthrop and other leaders in the dance field following every performance. This year we have an exciting new format for the series. All 32 choreographers selected will perform in a FESTIVAL SETTING March 3 – March 13, 2011. 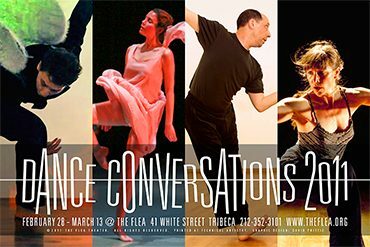 Click here for more info on Dance Conversations @ The Flea. The festival will run in conjunction with Dance Films @ The Flea, a new series showcasing the wonderful, diverse and creative work of dance filmmakers, followed by discussions with the filmmakers and artists who bring these works to life. Click here for more info on Dance Films @ The Flea.